Music therapy is offered on the Paediatric Inpatient Units, Paediatric Critical Care Unit (PCCU), Paediatric Medical Day Unit (PMDU), Neonatal Intensive Care Unit (NICU) and with the Child and Adolescent Mental Health Care Program (CAMHCP). Patients are seen by referral only. Any health professional can refer a patient to the music therapy program. Family members can also inquire with a staff member about the appropriateness of music therapy interventions during their stay in hospital. How Can Music Therapy Help? 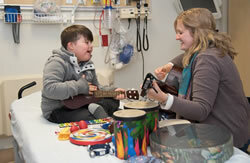 Music therapy is a research-based practice and part of the multidisciplinary team. A Certified Music Therapist uses music, within a therapeutic relationship, to support patients in improving areas of their health, functioning development and well-being. Sessions can be individual or group. Music therapy can support any patient regardless of age, musical skill, severity of illness, ability or culture.